Heart - Cyst in a male BALB/c mouse from a subchronic study. 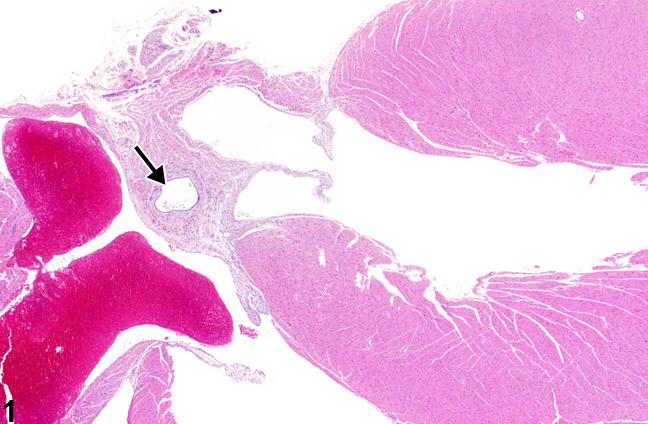 A cyst is present in the atrial septum (arrow). Heart - Cyst in a male BALB/c mouse from a subchronic study (higher magnification of Figure 1). Inflammatory cells are present in the tissue around the cyst (arrow). 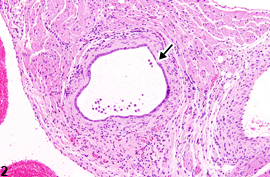 Heart - Cyst in a male BALB/c mouse from a subchronic study (higher magnification of Figure 1). 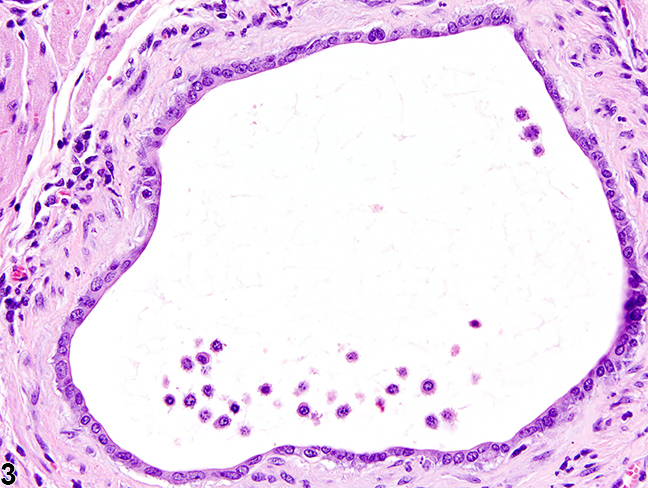 The cyst is lined by flattened epithelium. Cysts ( Figure 1 , Figure 2 , and Figure 3 ) are defined as epithelium-lined sacs, and in the heart, they are typically located within the atrium or near the interatrial septum. 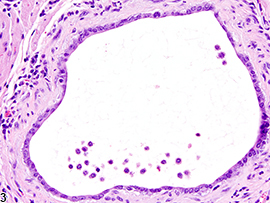 The lining epithelium is typically flattened. Cysts may be the result of a developmental malformation, possibly of thyroglossal duct origin. Cysts should be differentiated from cystic, ectopic thyroid or thymic tissue in the heart. Heart - Cyst should be diagnosed but should not be graded. The location of this lesion should be described in the pathology narrative. A diagnosis of "Cyst" should be used when the tissue of origin cannot be definitively identified. If the tissue is determined to be of thymic or thyroid origin, a diagnosis of "Heart - Ectopic tissue" is preferred. Elwell MR, Mahler JF. 1999. Heart, blood vessels, and lymphatics. In: Pathology of the Mouse: Reference and Atlas (Maronpot RR, Boorman GA, Gaul BW, eds). Cache River Press, Vienna, IL, 361- 380.